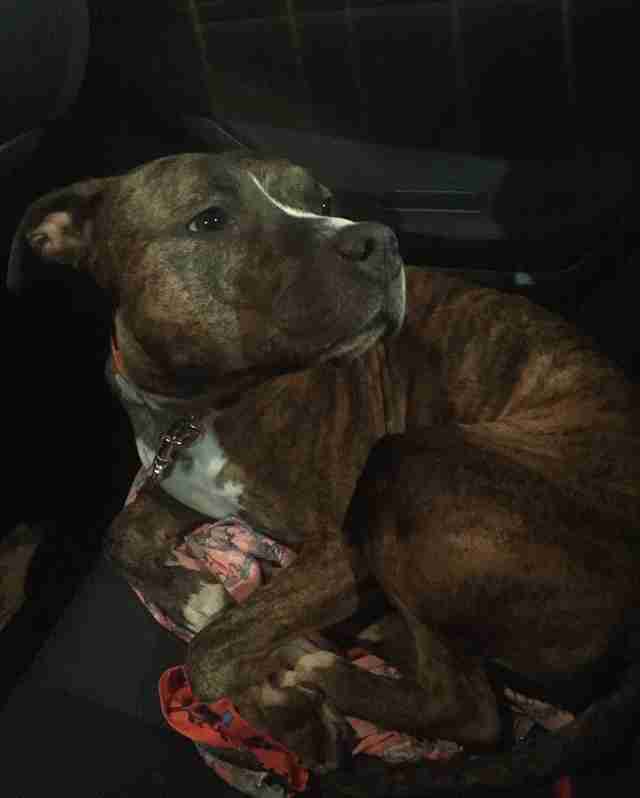 Sheana first arrived at a local municipal shelter in Long Island, New York in 2014. 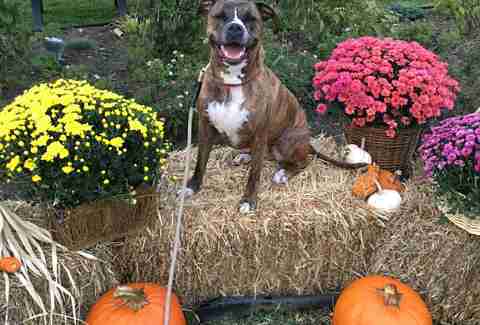 The boxer mix was assumed to be a stray, but an abrasion on her muzzle and her notably nervous behavior around people — especially men — made shelter employees think otherwise. 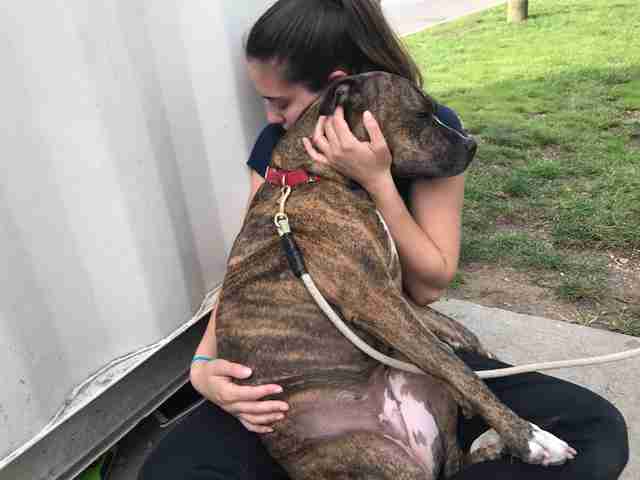 The person who dropped her at the shelter admitted that the scared brindle dog had indeed come from a physically abusive home, according to rescue workers, and like many maltreated animals, adjustment would be difficult. 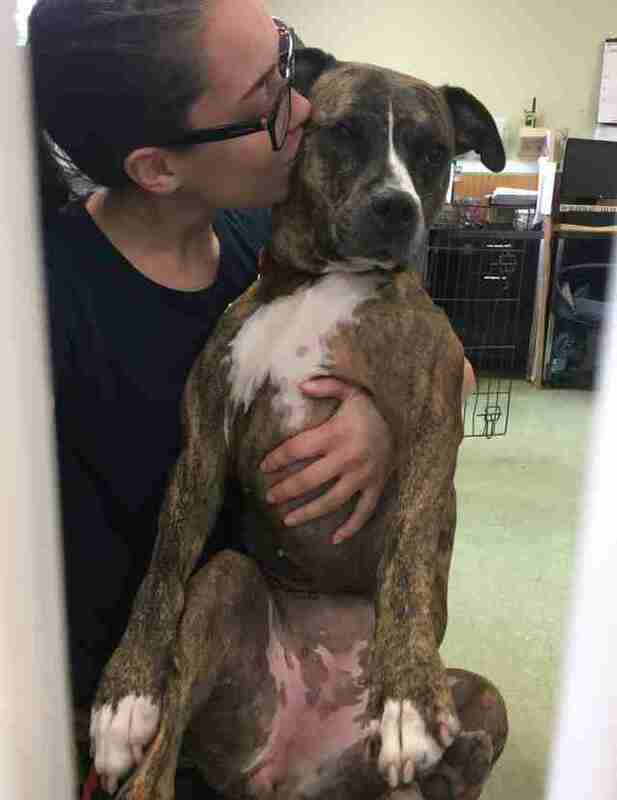 Still reeling from an early life of pain and neglect, the then 2-year-old dog slowly began to adjust to her cage at Hempstead Town Animal Shelter in Wantagh. 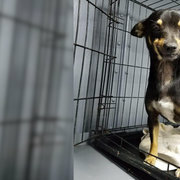 It seemed as if luck was on her side when she was taken in by a rescue organization and later sent to a training facility with hopes of helping her become comfortable around people. She was even adopted ... but it didn’t last. 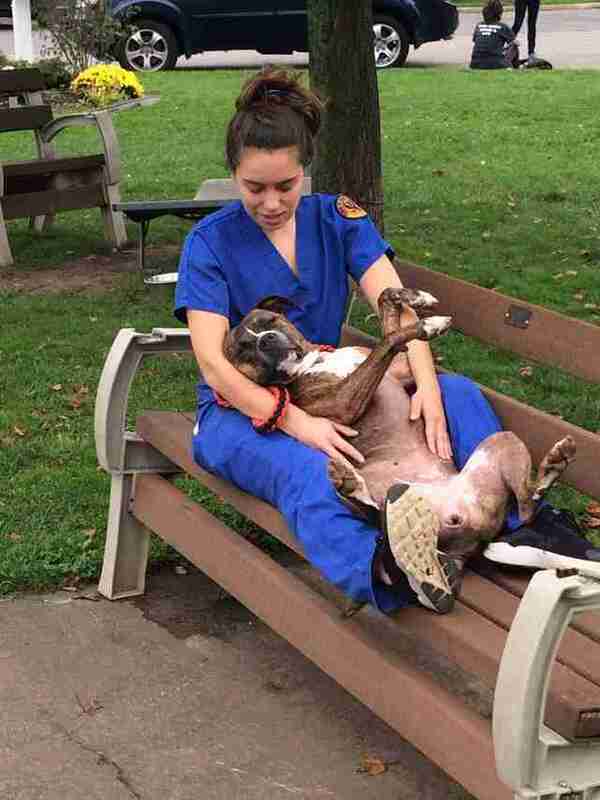 Sheana was returned to the rescue again and again, and three years later, she found herself right back at the Hempstead shelter where her journey began. 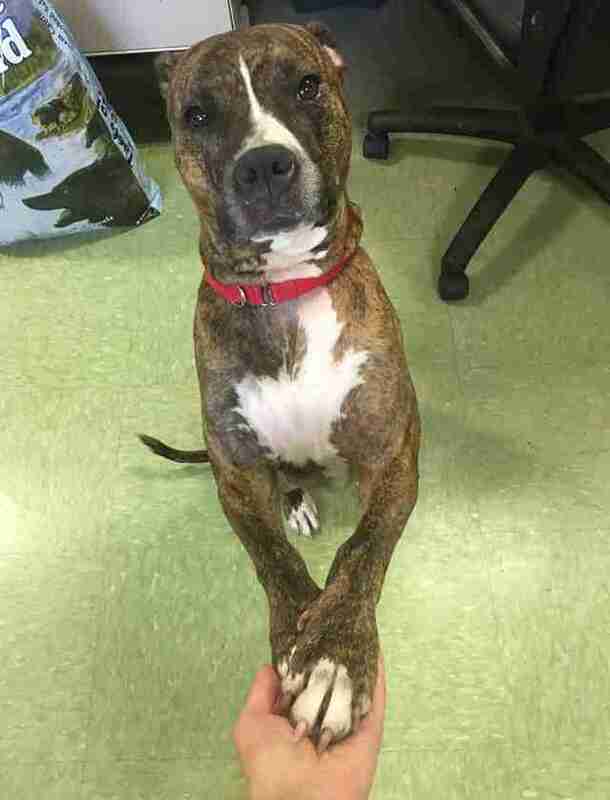 It broke shelter staffers’ hearts to see her returned for the 11th time. Sheana’s offenses have been mild — certainly nothing that would warrant so much bouncing around. One family returned Sheana to the shelter after she opened the fridge, wreaking havoc on food they had prepared for a BBQ, according to Fogarty. Sheana had been home alone at the time. Another family returned her when their frequent travel plans deprived her of the consistency she so desperately needs to feel comfortable. Like Goldilocks, Sheana needs a family that is “just right.” But finding a fit is proving to be more difficult than her rescuers initially imagined. 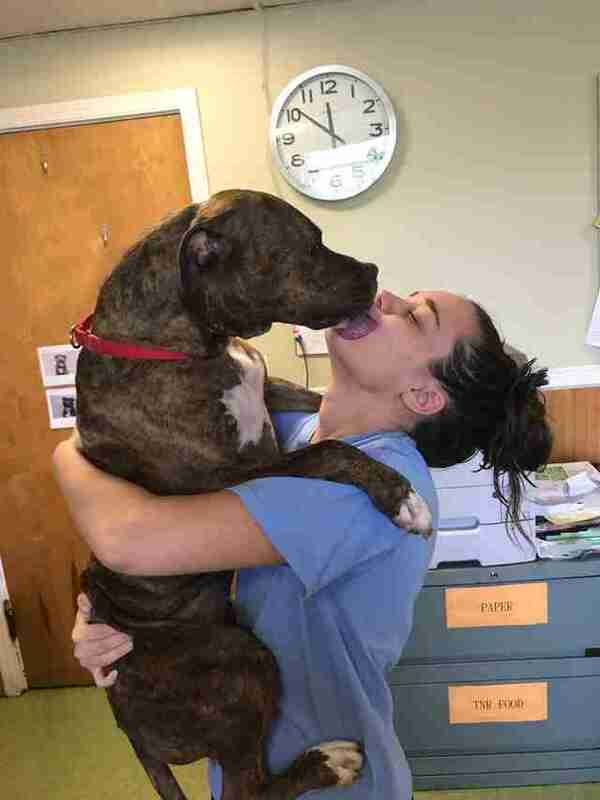 While it takes time for Sheana to warm up to new people, with slow introductions, she blossoms to the “most loving and cuddly dog,” Fogarty noted. She loves to play with tennis balls and show off, constantly working to expand her repertoire of tricks. “She knows all her commands (and I mean all) — sit, down, paw (both paws), she ‘prays’ on command, rolls over, stay, come, spin, she balances a treat on her nose and flips it up/catches it when told and we're working on her sitting up/pretty,” Fogarty explained. If one thing is clear, it is that Sheana needs a home — a forever home — and a family who will love her, quirks and all. No other gift would be as precious. If you are interesting adopting Sheana and live in the tristate area, contact Melissa Fogarty by calling (516) 785-5220 ext. 4632, or emailing at melifog@tohmail.org. Follow Sheana's adoption journey on Instagram at @adoptabledoggy.